Are you going on vacation and will be out of office for few days? One one wants to deal with email sending chores while on vacation. 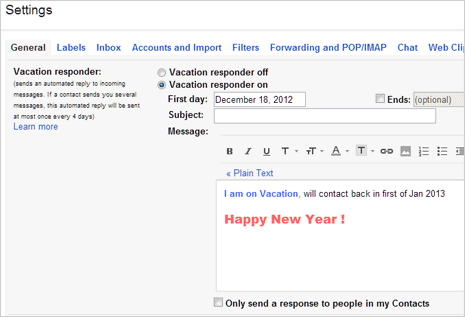 You can easily setup vacation responder in Gmail and Yahoo email account to enjoy holidays to fullest. Vacation responder will automatically send reply to every or selected incoming emails regarding your non-availability to reply because of current vacation. You can write and draft the automatic message contents that should be sent by vacation responder automatically. 1. Once you login into Gmail account, click on Gear icon at top right and then click on Settings option. 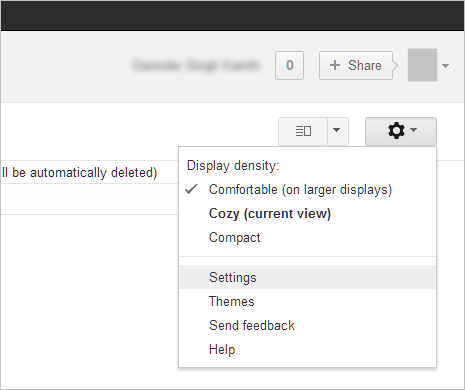 This will open Gmail Settings page from where we can setup and configure ‘Vacation Responder’. 2. Under the General tab, scroll down to Vacation Responder section. Click to enable “Vacation responder on” option to activate this feature in your Gmail account. Select the start date of the vacation and type subject of the email that will be sent by Vacation Responder. 3. Then type message you want Vacation Responder to email to contacts trying to reach you during vacation period. You can either type plain text message or rich formatting message with custom font size, font color, font style, images, hyperlinks and much more. 4. Once you have typed the message, click “Save Changes” button at the bottom. You can also click to enable “Only send a response to people in my Contacts” as per requirement. Once this feature is activated, any incoming email during vacation periof will get automatic reply (as drafted by you). You can stop vacation responder anytime by enabling “Vacation responder off” option. 1. Procedure for setting up automatic reply using Vacation Response in Yahoo Mail is similar to that of Gmail. 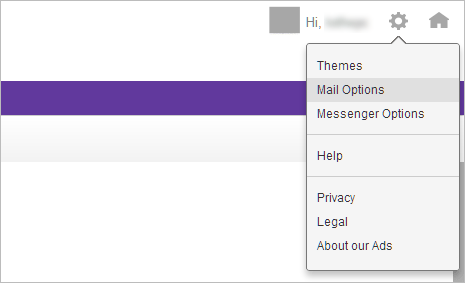 Login into your Yahoo Mail account (it has new look now), mouse hover Gear icon at top right and then click on Mail Options in the menu. 2. Click on Vacation Response option on the left sidebar under “Mail Options” section. Then click to enable “Enable auto-response during these dates (inclusive)” option. Select from and until dates of your Vacation (or out-of-office) period. 3. Then type the email message, Yahoo Mail only support plain text emails that can be sent using vacation response feature. Once you are done typing, you can click on “send sample copy to me” to preview the final message within inbox. 4. 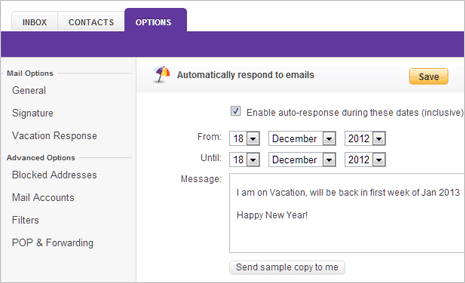 Click Save button at top right to confirm on vacation response automatic reply email settings in Yahoo Mail. You response will be automatically sent to people who send you an email to let them know you won’t be responding in a while. That’s it – now you can go on a vacation without any stress of having to reply to contacts trying to reach you during vacation period. After you are done with setting up of vacation responder, how about creating travel route online with Google Map Maker?